Don't want to purchase a throwaway Japanese saw with impulse-hardened teeth? Would you rather buy a century-old western saw of elegant design and sharp as blazes you can either resharpen or have resharpened for you? Then you may buy one of mine or have me sharpen Granddad's old beauty that's been gathering dust for far too long. My saws and those I service are always jointed, sharpened and set the way they're supposed to be, and you will enjoy the way they cut immensely. I sharpen both handsaws and backsaws. 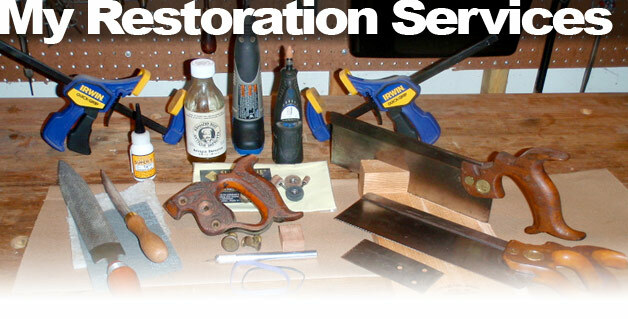 I also rehabilitate damaged and neglected saws. To further illuminate my restoration process, please feel free to review the article Chris Schwarz wrote about my company on his blog site. You can also check out the step-by-step procedure I used to fix Chris's old Groves back saw. A note on pricing: Though I list prices above, it's always best to contact me first, tell me what you'd like done, and ship the saw to me prior to payment. I'll analyze your saw(s), scope out the work, and send you an estimate for your approval prior to your completing the transaction; this is the most efficient way to establish clear expectations for the work to be done and at what price. A note about shipping costs: I only reflect a shipping charge for the basic sharpening service; no additional shipping charge applies for the other optional services listed in addition. Shipping charges graduate accordingly for more than one saw bundled per order (i.e. $9.50 for two saws, $11.50 for three, etc. ).